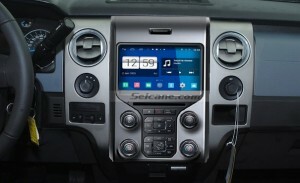 First show you the picture of Seicane 2012 2013 Ford F150 car stereo after installation. Do you think it’s cool and can’t wait to get one home? To install a new aftermarket car stereo is a simple thing with true instructions. 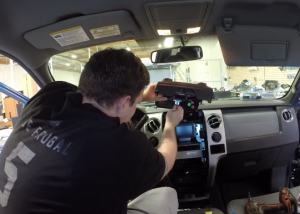 And first you’ll need to know how to install a stereo on your Ford F150. If you insist to do it yourself, you can ask a professional for help. The following steps are for your reference. You can refer to it but not rely on it. Please disconnect the negative cable on the vehicle battery to ensure security. Please prepare tools for the upgrade. A lever and a screwdriver are needed. Please protect the front seats and trim panel during upgrade, too. This Ford F150 car stereo has intelligent android 4.4.4 operation system, high quality RK PX3 with 1.66 GHz frequency Quad-core CPU, and 8 inch HD 1024*600 Pixels multi touch screen with smooth operation high sensitivity. Equipped with a WiFi module, the systems supports Internet surfing via 3G or WiFi. You can use the Quick Search Box on the Google search for roads, playing online games, watching videos, downloading online data, and checking emails by connecting to any WiFi hotspot in scope or 3G Internet. You can also install or remove any apps on RAM or SD according to your preference. The real-time traffic congestion maps can suggest you alternative routes to take so as to save you a lot of time. 1)Remove two screws at the bottom of the radio. 2)Unclip left side panel contain the air condition vents. 3) Unclip right side panel contain the air condition vents. 5)Unplug connector behind the radio interface panel. 6)Remove original LCD screen and unplug connectors behind it. 7)Have a patient look at those cables and antennas,plug them one by one as the instructions show,which is very important in your installation. 8) After all cables are pluged well, install Seicane radio into it. 9) Firm 2 screws under the radio and install removed panels back to your car. 10) With everything set well, turn on your radio and check all functions whether operate well. Hope this essay can benefit you, have a good trip with you new Ford F150 car stereo.